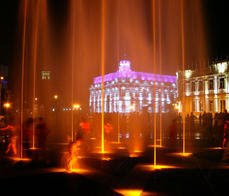 Batumi Travel Guide: Batumi night life, accommodation, traveling to Batumi and places to see. Batumi (ბათუმი) is a seaside city on the Black Sea coast and capital of Adjara a region in southwest Georgia. It has a population of about 120 thousand people. Batumi, with its large port, commercial center and tourism center, is also the last stop of the Transcaucasia railroad. It is situated some 12 mi from the Turkish border, in a subtropical zone, rich in citrus fruit and tea. Industries included tourism, shipbuilding, food processing, and light manufacturing. It's a beautiful city with a famous stony beach. The center is quite small and can be covered on foot. There are no real monuments, but quite a few houses that are worth a look; they mostly date back to the 19-th century when Batumi was an important border town in the Russian defence against the Turks. Gudauri: Ski resort in Georgia - place you need to go! Gudauri.info: excellent web resource for everyone who is interested in discovering Gudauri ski resort in Georgia. Useful information for skiers, boarders, hang-gliders, mountain-climbers and tourists of Gudauri and Georgia. List of hotels in Gudauri, galleries of amazing pictires and reports from customers. There is a link of weather forecast for Gudauri. Direct link. 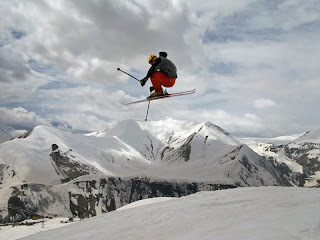 Heliskiing is one of Gudauri's most distinctive offerings and it provides skiers with access to some of the finest powder-snow in the Caucasus. With helicopters granted almost unrestricted access to local mountains, skiers can experience some of the most sublime runs in Europe - at altitudes between 1,500 and 4,200 meters above sea level. The helicopters drop clients off on mountain tops, glaciers, fabulous ridges - and in the hands of highly experienced guides. Gudauri's helicopters are serviced and operated by the Swiss company "Alpin Travel" Ltd.
USA, Austria, Belgium, Germany, Denmark, GB, Spain, Estonia, Japan, Ireland, Israel, Italy, Canada, Cyprus, Latvia, Lithuania, Luxembourg, Hungary, Poland, Portugal, Greece, France, Slovakia, Finland, Czech Republic, Sweden, Switzerland, Holland. To find out further details of getting visa to Georgia contact Georgian Diplomatic Mission in one of the following country. List of Georgian Diplomatic Missions. Pictures of Georgia - Collection of photos from all parts of the country. Easy search. Just click on the region on the map and enjoy beauty of Georgia. Direct link. This new website aims to be an informative and educational reference point for those who are interested in traveling to Georgia, Armenia, and Azerbaijan as well as for those who want to have more information about this beautiful and mysterious region of the world. Here you can find all kinds of information about how to plan a tour to Georgia as well as about Georgian Culture, History, Arts, Traditions & Cuisine, The capital Tbilisi (Tiflis) and main cities and some advice on what to read and see in Georgia. 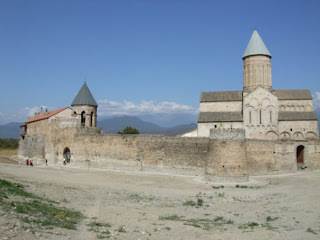 The Alaverdi Cathedral is located on the Alazani Valley, near the village Alaverdi (Akhmeta region), 20 km from Telavi. There, in the middle of the 6-th century was founded a monastery, by on of the thirteen Sirian fathers Joseph, who is buried here. Travel Agency "Days in Georgia"
Signakhi is a small town in the east of Kakheti region of Georgia. It is famous for the fortress of the same name, which is listed among the most known and major fortresses of Georgia. The walls of Signakhi fortress have miraculously survived and even today surround the old part of the city and stretch far beyond the city limits. The watchtowers with the remarkable view to Alazani valley are still standing along the walls perimeter. 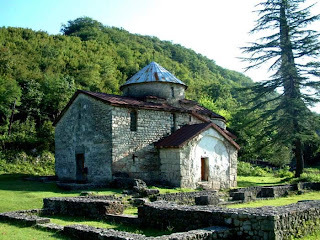 Fabulous photos taken in Georgia, Kaheti region, Telavi and Signagkhi (Signaxi) by one German girl Dana who now lives, works, and travels in Georgia and keeps blognotes of her experience. Her blog is in German, but anyway you will be able to see the beauty of this place even if you don't understand German. Here is a link. Legend of Argonauts (Argo) and Golden Fleece - Discover the place of this ancient story in Georgia! Nokalakevi Architectural Historic Monument: Nokalakevi-Tsikhegoji-Archaeopolis is one of the most important monument of the early Middle Ages, which is situated in the west Georgia, in 17-km North-East from the town Senaki. The site lies on the left bank of the river Tekhuri, where the river flows out from the rocky gorge and sharply turns to East. In result the city is bordered by the river from three sides. According to the 19th - 20th centuries' researchers the mitic city Aea , from where Iazon, Medea and Argonauts stole the Golden Fleece, lied exactly there where Nokalakevi is situated now. Dubois de Montpereux was the first who expressed this idea in 30s of 19th century. To read more visit Nokalakevi monument website here. Georgian Cultural Heritage Information Center (GCHIC) is a Non-Governmental Organisation aimed at obtaining and keeping archive of the qualified information on diverse branches of the Georgian cultural heritage, as well as ensuring accessibility and availability of this information through scholarly and popular publications, exhibitions, electronic network, etc. GCHIC organises research-recording expeditions throughout Georgia and to the Georgian cultural heritage sites abroad; processes information based on typology, chronology, geography - in the form of ID cards, lists, annotations, etc. 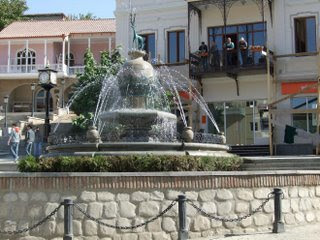 ; disseminates information on the site facing the danger of vanish or damage; ensures protective measures on the unique and endangered heritage sites; supports interested individuals (teams) and professionals in obtaining better knowledge on significant well-known as well as less-known Georgian cultural heritage sites. Direct link. Tbilisi State Medical University: (TSMU) is a leading Medical University in Europe. TSMU was founded as Tbilisi Medical Institute in 1918 and became the Faculty of Medicine within the Tbilisi State University (TSU) in 1930. Finally the insitution gained independence and became Georgia's only Medical University in 1991. Jewellery and Metalwork section of Architecture.ge introduces the visitor to the world of ancient and highly original artistic traditions. It's devided in two parts. The first part presents Georgian jewellery and metalwork of Pre-Christian times from the collection of the Janashia Museum of Georgia, the largest in Transcaucasia. The creative efforts of Georgian jewellers (3rd millennium B.C. - 3rd century A.D.) are illustrated here by golden necklaces, fine chains, diadems, torques, bracelets, signet-rings, pectorals, pins, fibulae, and gold and silver vessels inlaid in colored stones, smalt and enamels. The second part, Middle Ages, deals with the collection of medieval chased and embossed work from the Art Museum of Georgia, which comprises the collections of the former Church Museum and of the Ancient Arts Museum of the University of Georgia. The museum possesses a valuable collection of jewellery of the feudal epoch (4th-18th centuries), which boasts such gems as the 10th-century Chalice of Bedia, the Khakhuli triptych, and the works by the celebrated Georgian goldsmiths Beka and Beshken Opizari. The UK and Georgia established diplomatic ties in 1992 and the UK has since become an active friend and partner of Georgia assisting, for example, with the development and promotion of human rights, good governance and the rule of law. There have been many cultural and educational links during this time. Read more here. We build mutually beneficial relationships between people in the UK and other countries and increase appreciation of the UK's creative ideas and achievements. The National Professional Agency (NPA) in Georgia aims at establishing and sustaining the demand-led system of vocational education and training (VET) in Georgia, which will adequately reflect the labor market requirements on workforce knowledge, skills and competencies. The Agency provides policy recommendations to the Ministry of Education and Science of Georgia (MoES) in the field of vocational education. Moreover, the Agency is supposed to provide the required support to the MoES for the VET policy implementation. Open society Georgia Foundation was established in 1994 by New York Open Society institute. The foundation is a member of a network of foundations established by George Soros. Based on its priorities, the foundation issues grants to non-profit, non-governmental organizations and individuals. The aim of the foundation is to promote values of open society in Georgia. It serves only chartable purposes and the protection of public interests. Watch Georgian Dance: Khevsuruli (ხევსურული) – This mountain dance is probably the best representative of the Georgian spirit. It unites love, courage, and respect for women, toughness, competition, skill, beauty, and colorfulness into one amazing performance. The dance starts out with a flirting couple. Unexpectedly, another young men appears, also seeking the hand of the woman. A conflict breaks out and soon turns into a vigorous fighting between the two men and their supporters. The quarrel is stopped temporarily by the woman’s veil. Traditionally, when a woman throws her head veil between two men, all disagreements and fighting halts. However, as soon as the woman leaves the scene, the fighting continues even more vigorously. The young men from both sides attack each other with swords and shields. In some occasions, one man has to fight off three attackers. At the end, a woman (or women) comes in and stops the fighting with her veil once again. However, the final of the dance is "open" –meaning that the audience does not know the outcome of the fighting. As a characteristic of Georgian dances, Khevsuruli is also very technical and requires intense practice and utmost skill in order to perform the dance without hurting anyone. Georgian Dance: Davluri (დავლური) – Davluri is also a city dance, but unlike Kintouri and Karachokheli, it portrays the city aristocracy. The dance reminds us of Kartuli. However, the movements in Davluri are less complicated and the male/female relationship is less formal. The dance is performed by many couples and with the music and colorful costumes, paints a picture of an aristocratic feast on stage. Geoland - GPS technology in the Republic of Georgia: GPS navigation, Garmin in Georgia, Maps and cartography: GeoLand Ltd was founded in 2003 by a team of young enthusiastic professionals, dedicated to bringing GPS/GIS technology to Georgia and the South Caucasus.It quickly began growing into a modern GIS technology company and today our team members include specialists in cartography, geography, geodesy and IT, some have background in alpinism and mountain rescue operations. Lobio (Kidney Bean Salad): The word lobio also designates dried beans and the salads prepared from them, mainstays of the Georgian table. Fine red and white kidney beans, smaller than our domestic varieties, grow wild in Georgia and are sold at the market, dried but not sterilized. Sometimes bugs hide in these beans. It has not dampened the longevity of us Georgians one bit. While American processing has taken care of the aesthetics, too often our beans have languished on supermarket shelves. Try to find small beans that are not old and starchy. If you are close to an Armenian community they should have them available. 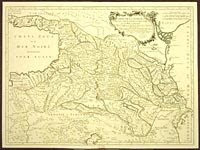 Ancient Map of Georgia, Venice 1775. The Georgian Collections in the Library of Congress: Georgia has been represented in the collections of the Library of Congress since its inception. The library of Thomas Jefferson was purchased by Congress in 1815 after the destruction of the original collection during the War of 1812. Jefferson was keen on the sources of antiquity which were replete with mention of the land of Colchis, the home of the princess Medea and of the famed Golden fleece. Caucasus Online, Sanet.ge - is the first and fastest growing Georgian Internet service provider. We keep leading position on ISP market due to affordable, high quality service we provide. Effective management, cutting-edge technologies and innovation - these are the key ingredients of our success. Tbilisi, Georgia State Archives: Georgia who has the valuable records is one of the countries owing rich archives both in quantity and in quality. The most important and rich archival materials are in the Central State Archives. The Georgian Central State historical archive of Georgia was founded in 1920. The archive shelters documents dating from 9th century up to 25th of February 1921. The sources of the archive contain historical manuscripts, acts, handwritten books, private funds, funds run by state authorities, courts of law and public prosecutors, military bodies, police offices, institutions of public economy, scientific, cultural and educational institutions and organizations, etc. The archival funds shelter about 1 million items. The Georgian Central State archive of modern history of Georgia was founded in 1927. In this archive there are kept documents dating from 1921 to the present time. Among the latter one can mention documents of top government authorities, central executive committee, presidium of the supreme council and the council of the ministers of Georgia SSR, different ministries, state committees, administration, industrial associations, factories, scientific and research institutions, centers of higher education, sport societies, trade unions and voluntary organizations, etc., which reflect the historical processes, political, economic and social development of Georgia from 1921 to the present time. In the archive are also kept funds of private origin, pertaining to scientists, professors, engineers, doctors, sportsmen, social activists, etc. 1050 funds of the archive hold more than 800 000 items. Tbilisi Ivane Javakhishvili State University, better known as Tbilisi State University (TSU), is a university established on 8 February 1918 in Tbilisi, Georgia. TSU is the oldest university in the whole Caucasus region. Over 35,000 students are enrolled and the total number of faculty and staff (collaborators) is approximately 5,000. Football Club Dynamo Tbilisi (Dinamo Tbilisi)- one of the oldest and renowned football teams in Georgia playing for the the capital of Georgia, Tbilisi. It was one of the strongest teams in the USSR, when the club was a part of the Soviet Dynamo sports society. Its main achievement was winning the Cup Winners' Cup in 1981, beating Carl Zeiss Jena of East Germany 2-1 in the final in Düsseldorf. Here is a picture of the team right after this phenomenal victory. Cup Winners names: O.Gabelia, A.Chivadze, S.Khinchagashvili, N.Khizanishvili, G.Tavadze, V.Daraselia, Z.Svanadze, T.Sulakvelidze, V.Gutsaev, D.Kipiani, R.Shengelia, N.Kakilashvili, V.Zhvania. Goals scored by V.Gutsaev (1:1) and V.Daraselia (2:1). Helmut Schon, World Cup 1974 winner German National Team`s head coach said: "It is to be said directly, Dinamo deserved the victory. This team has top quality performers. 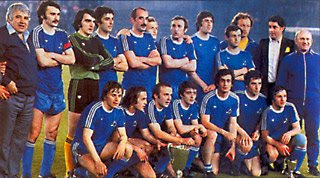 "FC Dinamo Tbilisi became eastmost European trophy holder team. Website of Dynamo Tbilisi is here. You can find there Dynamo Tb. history, news, results and tournament information. One of the biggest exports for Georgia is hazelnut (filbert nut). The Georgian hazelnut and walnut traditionally maintains positions among the top ten goods exported from Georgia. In the first half of 2007, these products ranked ninth. They account for approximately 3.4% of Georgian exports. Hazelnuts from Georgia cover 5-7% of the world’s nut market. Nearly 18,627 million USD of nuts are exported from Georgia every year. In 2006, the amount neared 25,591 million USD. Its export share equaled 5.6%. There has been consistent growth of nut production since the 1990s. Since then, nut production has grown 5% annually. ESTADO TRADING LLC, is one of the largest supplier of Georgian Hazelnut. The capacities of Estado factories enable the company to export 450 tons of hazelnut kernels monthly. In seasons of 1999-2003 they provided more than 6000 tons of hazelnut kernels for customers in Western European countries. Another big player is the company Georgian Nuts. Kakha Bochorishvili, a Georgian Nuts spokesman, said, “Our company exports Georgian nuts in almost all European countries. In 2006, we exported 1,300 tons. Third producer I would like to mention is Argo Nuts. LTD Argo Nuts was founded by the joint investment of Dutch company Loyal Capital Group BV and EBRD. The main goal of the company is to process and export Georgian nuts. The nut-processing factory of LTD Argo Nuts was constructed in 2006. It is located in Zugdidi, in western Georgia, where the main reserves of Georgian nuts exist. The factory is equipped with modern Italian Browind technology and has a contemporary lab for quality control. The monthly production volume of the factory equals 1,200 tons. There are rumors that the idea of eastablishing Argo Nuts belongs to Hillary Clinton brothers' Hugh and Tony Rodham. Article from The Independent is here. The Strategic Research Center (SRC) in Tbilisi, Georgia is an independent think tank for policy analysis and development established in 1991 with the mission to support the processes of conceptual and organizational development of new social system and sovereign statehood building in the Republic Georgia. SRC supports policy-making processes in all branches of government, political and social organizations to bring about significant policy and institutional changes. SRC provides: Analytical Research, Policy Advice, Program Evaluation, Capacity Building, Civic Education. The air company "Airzena Georgian Airlines" operates direct flights to Paris, Frankfurt, Vienna, Amsterdam, Athens, Kiev, Moscow, Dubai, Tel-Aviv, Minsk. Airzena Georgian Airlines was founded in September 1993. The air company primarily operated charter flights to China, Egypt and other countries. For that period in spite of complicated economic and political situation, the air company achieved to get its own place and due to the correct strategy retained its share in the aviation market. On November 1, 1999 the merger of two airlines "Airzena" and "Air Georgia" resulted in foundation of "Airzena Georgian Airlines". It became the biggest air company in Georgia. It was assigned a flag carrier status.